In California, many people rely on buses as a safe and cost-effective way to get to and from work, school, run their errands, and even travel to other cities and states. Unfortunately, serious bus accidents happen more often than most people realize. According to the Federal Motor Carrier Safety Administration (FMCSA), buses and large trucks were involved in an estimated 119,000 injury crashes—and 4,440 fatal collisions—in 2016 alone. Sadly, California boasts more than its fair share of devastating bus and large truck crashes. FMCSA data from 2014 to 2016 places California among the top 10 states with the highest average of fatal bus crashes. If you were hurt in a California bus accident, you may be entitled to compensation for injuries and other losses. 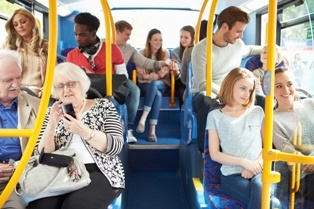 Read on to learn more about your rights and legal options as an injured bus passenger. Motorist or bus driver error. This cause includes all manner of unsafe driving behaviors, such as speeding, reckless driving, distracted driving, drunk or drugged driving, and drowsy driving. Mechanical failure. Commercial buses are subject to wear and tear, just like any other type of vehicle. Forgoing regular inspections and routine bus maintenance can result in mechanical failures that can cause accidents and endanger everyone on the road. Other factors. Bus accidents may also be caused by additional factors, such as poor road or weather conditions. Bus accidents can cause injuries that range in severity from minor to deadly. Some of the most common injuries associated with bus accidents include whiplash and other soft-tissue injuries, head and brain injuries, broken or crushed bones, spinal cord injuries, and amputations. An attorney can advise you on whether any other types of damages may be applicable to your case. There are many things passengers can do after a bus accident to protect their legal right to pursue and collect compensation for damages. For example, seeking immediate medical attention not only helps safeguard your health, but it can also ensure that accident-related injuries are documented in your medical records. These records can serve as evidence in your personal injury case. Don't discuss a settlement or sign forms on the scene without first consulting an attorney to ensure what you're signing is actually in your best interest. Additionally, refuse to provide a recorded statement to an insurance company without consulting an attorney. Though the adjuster may suggest that giving a recorded statement might help your claim move along more quickly, what you say in this recording can be used against you later. You won't be able to avoid talking to the adjuster forever, but, not to worry, a skilled personal injury attorney can help you prepare for questions and carefully craft your answers. There's a lot at stake after a serious bus crash. If you were hurt in a bus accident caused by someone else's negligence, the seasoned attorneys with the Inland Empire Law Group can help you protect your rights and build a strong case for compensation. Contact the Inland Empire Law Group today at (888) 694-3529 or (909) 481-0100 to schedule an appointment for a free initial case consultation.